This Triple Seven gets deiced before leaving the gate at New Chitose Airport. 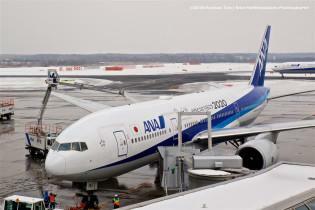 Markings on the fuselage show that ANA is the official airline partner for the 2020 Tokyo Olympic and Paralympic Games. ANA has 12 of these extended range -200s in their fleet. The 777-200 ER was the second variant introduced in February 1997. Thirty-three customers received 422 deliveries with 338 still in service. Fuji X-E2s w/18-135mm.